Reportedly tired and quarreling with their leadership, the main Central American caravan (“caravan 1”) split apart somewhat overnight, stopping in various Veracruz towns. Some spent the night in Juan Rodriguez Clara while others rested in Isla, about 13 miles north. Some caught rides with the aim of reaching Tierra Blanca, further north. Isla is 730 miles from the U.S. border, while Tierra Blanca is 672. The immediate destination of the various groups appears uncertain, but speculation is that they will veer away from the coast and head toward Cordoba and Puebla, on their way to the U.S. by way of Mexico City. As we told you yesterday, an agreement with the Veracruz governor to provide buses to transport the group to Mexico City fell through on Friday, causing the group dissension displayed on Saturday. Nevertheless, stretched thin or splintered, the caravan continues on. 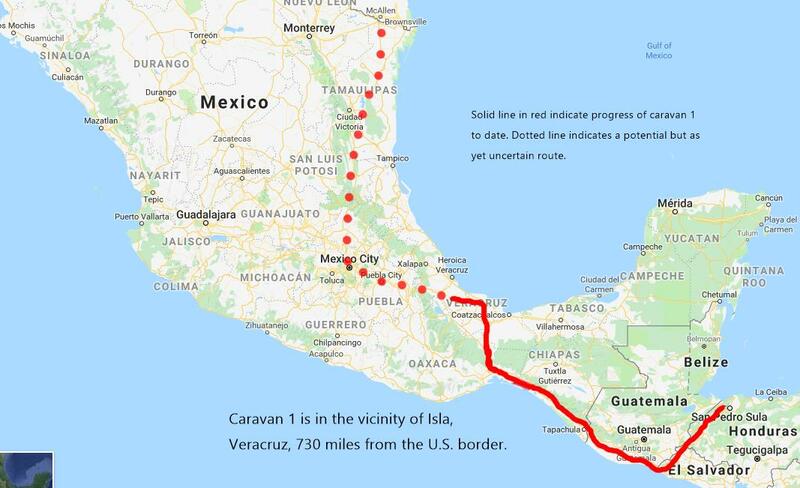 There is little reliable word today on the location of caravans 2, 3, and 4, mentioned yesterday.